I've been wondering where my feathered friends have gone. The feeder was hanging half full... yet no visitors for ages. Today I went out to inspect and discovered that all that was left was dried corn which was clogging the holes. I felt badly for not realizing sooner so set out a feast this morning. In no time at all my friends returned. We're located on a migratory path and see a lot of different birds here. It's lovely to see four or five totally different birds sharing the goods. Sometimes they get a bit bossy and dive bomb one another, but mostly everyone gets along. Yellow birds in winter are like a wisp of summer. 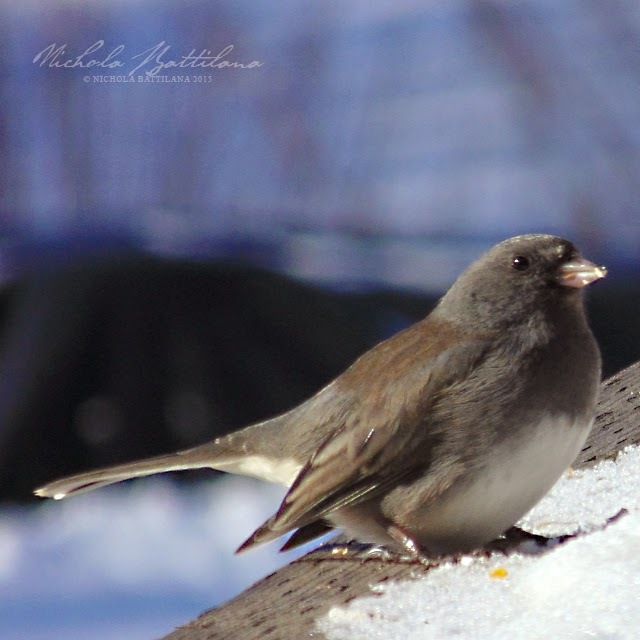 The bird above is one of my very favourites, a dark-eyed junco. 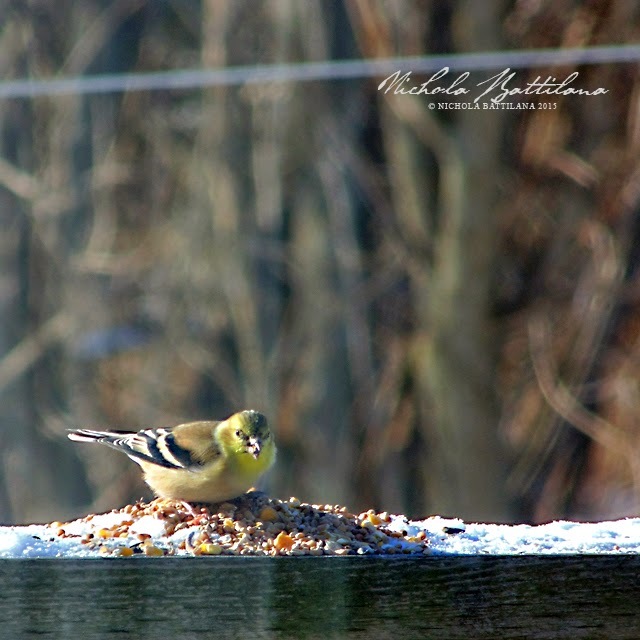 They prefer scattered seed over the feeder and enjoy the spoils that fall from the feeder. 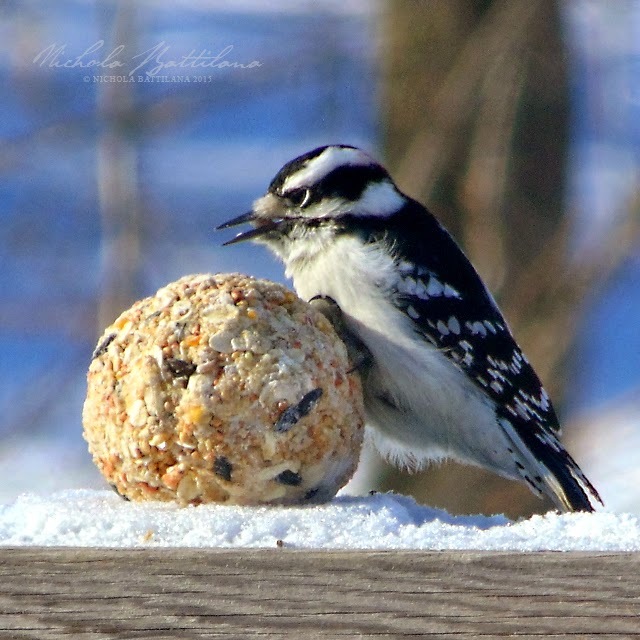 The sweet girl above is a downy woodpecker. You can tell her apart from the boys because she is missing a patch of red feathers at the back of her head. Everyone was having a grand time and having their fill until this cheeky thing came bounding along. I've been watching a family of squirrels poking in and out of a hole in the tippy top of one of our old black locust trees. Lucky for him they've been entertaining or else I would have shooed him away. What sweet critters you have! Excellent photos of your birds Nichola! However did you get so close? We have the same birds that you have! Funny they even look alike! 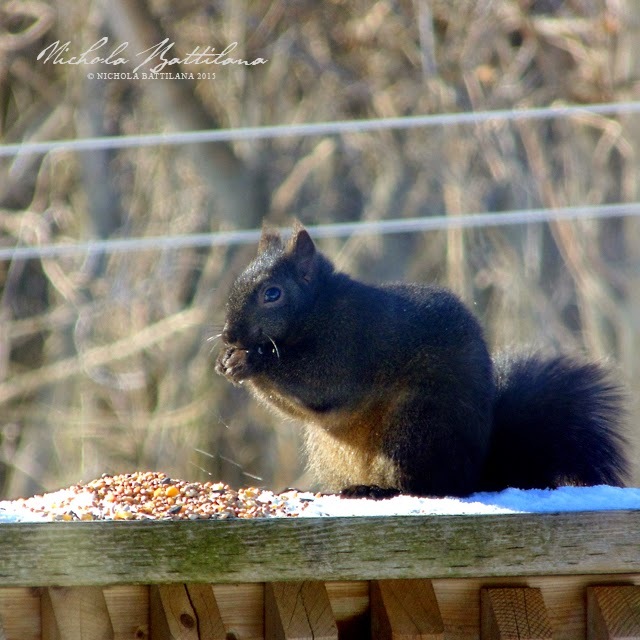 Is your squirrel black? We have very big and fat grey squirrels and little fast red ones-they raid the feeders like mad! We loved seeing all the birds at our old house - usually a pair of cardinals, chicadees, and three different types of woodpeckers. After much too long, we finally hung a feeder at our new house last week and have had so many beautiful visitors - even our first ever owl! 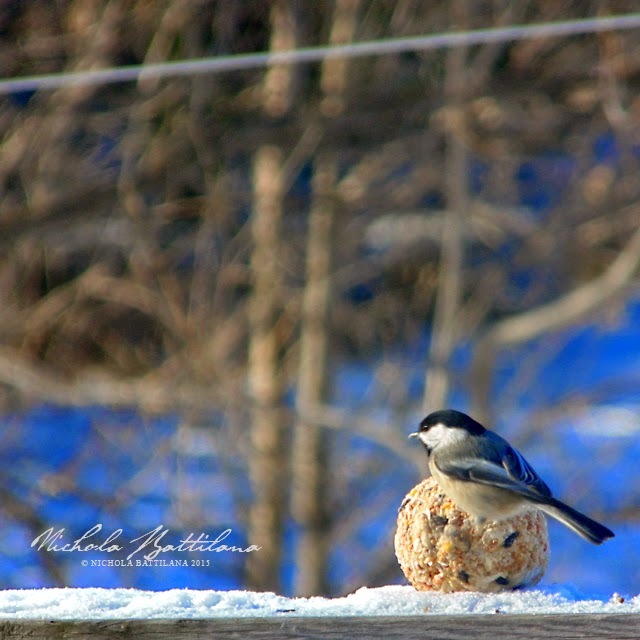 It's so peaceful to watch the feathered friends feast on our offering.